Hailed as a new Fourie du Preez a year or so ago, Marco Jansen van Vuren now has to revive his career at Loftus. In South African rugby, our obsession with size is well known but it’s not often a player moves because he is considered too big. 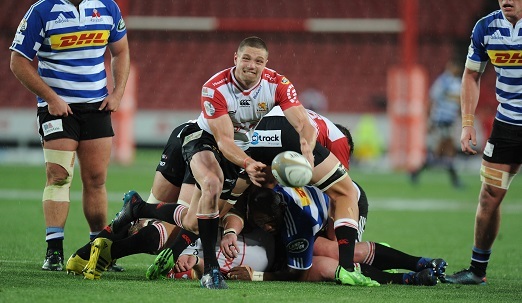 But that is the case with Marco Jansen van Vuren, who has joined the Bulls for this year’s Super Rugby campaign, having left the Lions, where he burst on to the scene in the 2017 Currie Cup. The 22-year-old from Vanderbijlpark is more than six feet tall and has drawn comparisons with other lanky scrumhalves like Joost van der Westhuizen, Fourie du Preez and Robert du Preez. But he only made four Super Rugby appearances under new Lions coach Swys de Bruin, and after an unsuccessful foray into Sevens rugby, he has decided to join the Bulls. “Swys de Bruin likes shorter, nippy scrumhalves but here at the Bulls it suits me much better because they want the scrumhalf to be a more controlling player, to look after the exits, and kicking is one of my strengths. So the game-plan suits me more here, at the Lions they didn’t really use my strengths because they wanted to play more of a running game. “My agent and I decided that I better move to get more game-time because I didn’t play in the Currie Cup last year. How Joost played was amazing, Fourie du Preez as well. Why not have a tall guy at number nine? In Grade XI at Hoerskool Transvalia they tried me at outside centre and that didn’t go so well!” Van Vuren said. Jansen van Vuren completes a very young quartet of scrumhalves at Loftus Versfeld. Andre Warner is the oldest at 25 years old, while Ivan van Zyl is 23, Van Vuren 22 and Embrose Papier 21. The new arrival has been playing against Papier and Van Zyl since they were children and they all graduated to playing together in the SA U20 team in 2015/16. “I played U20s with both Embrose and Ivan so we have a young group of nines. It will be great competition and we will get the best out of each other, every day we will be pushing each other. So I’m excited for the season ahead, I last played a competitive match five months ago and I can’t wait to get back into it,” Jansen van Vuren said.